One of the decisions air traffic controllers make is when and how much to reduce arrival traffic at an airport in response to capacity reductions due to adverse weather conditions. 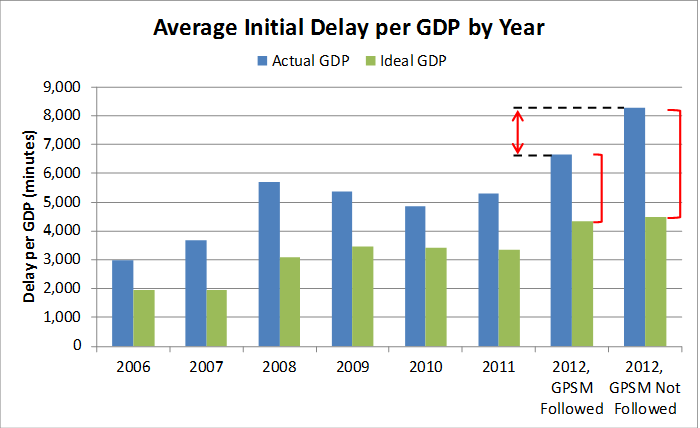 These decisions are termed ground delay programs (GDPs). Traditionally controllers have issued GDPs by applying heuristics that only account for known (deterministic) weather and traffic conditions. NASA asked Mosaic to build a decision-support system (DSS) that accounts for weather uncertainty in recommending optimal GDP decisions to controllers at the San Francisco International Airport (SFO). Mosaic built the GDP Parameter Selection Model (GPSM). The model consumes probabilistic weather forecasts produced by the SFO Marine Stratus Forecast System. The key random variable was the time of day when stratus cloud cover burns off over SFO. The optimization model attempted to minimize expected ground delay subject to risk-management constraints. This optimization criterion had the benevolent side effect of also reducing underutilization of arrival slots after the clouds cleared. Mosaic built the GPSM to integrate seamlessly into existing air traffic control infrastructure, requiring no changes to the data, software, or organizational processes used to issue GDPs. This made adopting the GPSM straightforward for the decision makers. 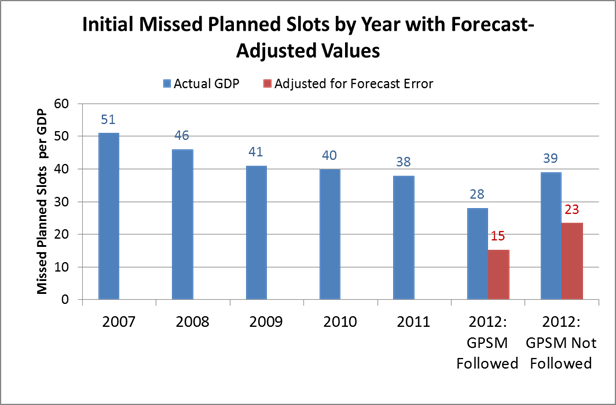 Preliminary test results in 2011 demonstrated the GPSM would reduce by 20% ground delays resulting from weather-related GDPs. Operational test results in 2012 replicated this benefit, despite unusual weather patterns, weather-sensor outages, and gradual decision-maker acceptance. Moreover, the gap between planned and observed unused arrival slots fell by 29% compared to the gap for the preceding three years. The delay reductions translate into approximately $7.5 million dollars in annual airline operating-cost reductions at SFO alone, representing a 1,100% return on investment (ROI) over a three-year time horizon. When the FAA applies GPSM technology at other airports, the ROI will increase dramatically. Lara S. Cook, Bryan Wood, “A Model for Determining Ground Delay Program Parameters Using a Probabilistic Forecast of Stratus Clearing,” Eighth USA/Europe Air Traffic Management Research and Development Seminar (ATM 2009), 2009. 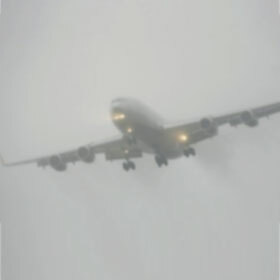 David W. Reynolds, David A. Clark, F. Wesley Wilson, Lara Cook, “Forecast-Based Decision Support for San Francisco International Airport: A NextGen Prototype System that Improves Operations during Summer Stratus Season,” Bulletin of the American Meteorological Society, Oct. 2012.